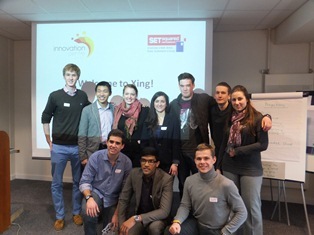 SETsquared held the Xing Challenge at the Innovation Centre, Exeter yesterday. This was the second event this year supporting student enterprise and providing the students with the opportunity to improve their business and entrepreneurial skills ready for the challenges after graduation. The Xing challenge was a day long event, where five teams made up of students from each of the five SETsquared universities, were each given a hypothetical business idea based on a genuine company. During the day, they used the Xing tool, a visualising planning game, to develop a strategy that would make their team’s company grow successfully. The event concluded in a ‘Dragons’ Den’ style finale where each team pitched their business plan to a panel of six invited expert judges from different business sectors. There were two winning teams. One for their impressive pitch, and the second for their sound financial modelling. In addition, two students were individually recognised for the clear presentation of the financial aspects of their businesses. Each person received a £50 Amazon voucher.